Teamwork. The concept is simple enough, but many physicians find it difficult to accomplish based on a longstanding standards of medical practice. 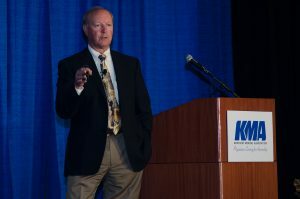 That needs to change, Bruce Bagley, senior adviser to the Professional Satisfaction and Practice Sustainability effort at the American Medical Association, told physicians attending the Kentucky Physicians Leadership Academy at the KMA Annual Meeting Sept. 10. Spreading work around, he said, can help physicians avoid burnout and gain more job satisfaction. Bagley was discussing the AMA’s STEPS Forward program, a practice-based initiative aimed at helping physicians meet the Quadruple Aim—better patient experience, better population health and lower overall costs with improved professional satisfaction. With changes like electronic health records increasing administrative tasks and time spent working, physicians often have little time to rejuvenate and spend time with family. But Bagley said things like that—and MACRA, insurance plans and other things people “are doing to us”—only account for a small amount of the burnout factors. “Only about 20 percent of why you feel hammered at the end of the day has to do with those things,” he said. “Eighty percent is about operational inefficiencies. That will mean identifying standard work, like working with patients to get a flu shot, shouldn’t fall in the physician’s realm of work. Technology can help, Bagley said, but many people aren’t using it. “Could we use text messaging to remind people of things they should do or checking in with them about how they’re doing this week as compared to last week?” he said. Doctors shift away from emailing patients because they don’t want the volume of emails that might clog their inbox. But Bagley said a staff member could handle emails the way they do calls. With calls, he said, somebody gets the information and triages it. With email, staff members don’t have to do the keyboarding—the patient has already done it. Donald Wilson, M.D., F.A.C.O.G., an OB/GYN who serves as medical director at PrimaryPlus in Maysville, liked what he heard about teamwork from Bagley. Physicians can learn more about the STEPS Forward program at www.stepsforward.org.